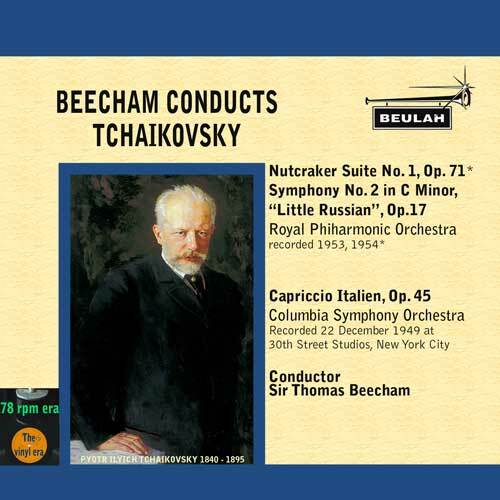 "As with his recordings of Haydn’s ‘London’ Symphonies, Sir Thomas Beecham’s performances of the last symphonies of Mozart could hardly pass muster as authentic but they also share the ‘naughty but nice’ quality of his Haydn and I was very pleased to make their acquaintance again in new transfers from Beulah: Nos. 35 (‘Haffner’), 36 (‘Linz’) and 38 (‘Prague’) on 1PS15 [65:34] and Nos. 39, 40 and 41 (‘Jupiter’) on 2PS15 [78:52]. 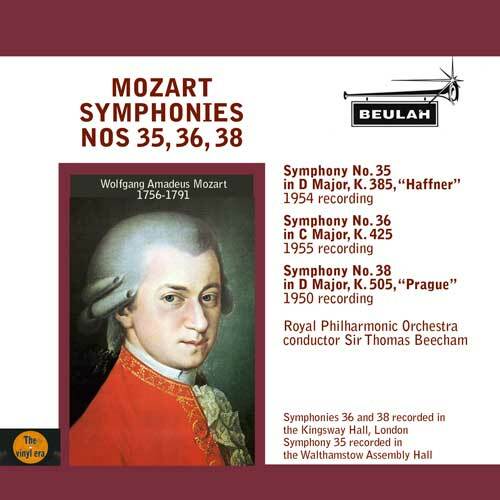 Of the three classic recordings from this period, Karl Böhm, whose Mozart I also like, is a little too stately for many and it’s swings and roundabouts between Beecham and Bruno Walter. 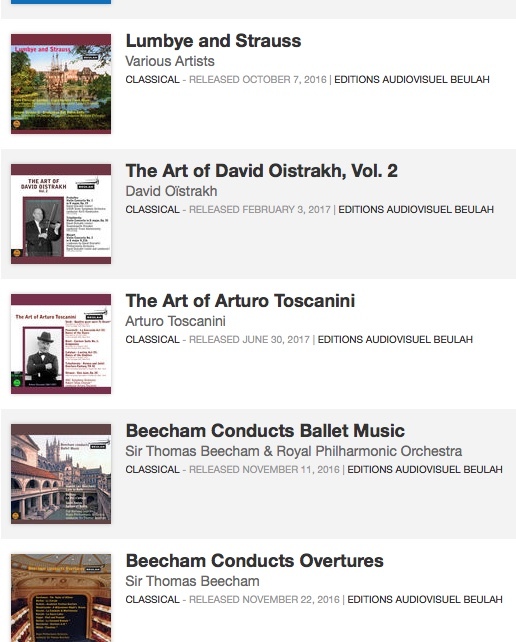 With these recordings otherwise available together only in Sir Thomas Beecham: The Classical Tradition, the Beulah releases are very welcome." 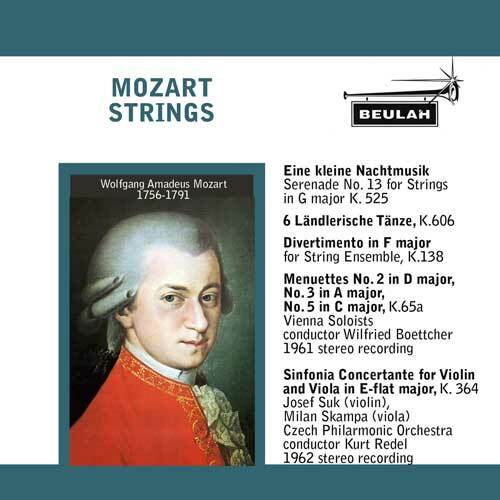 " More Mozart from Beulah with the title Mozart Strings: Serenade No.13 (Eine kleine Nachtmusik), Divertimento in F, K318, and a selection of dances are performed by The Vienna Soloists and Wilfried Boettcher (rec.1961), coupled with the Sinfonia Concertante for violin and viola, K364, recorded for Supraphon by Josef Suk and Milan Skampa with the Czech Philharmonic and Kurt Redel in 1962. 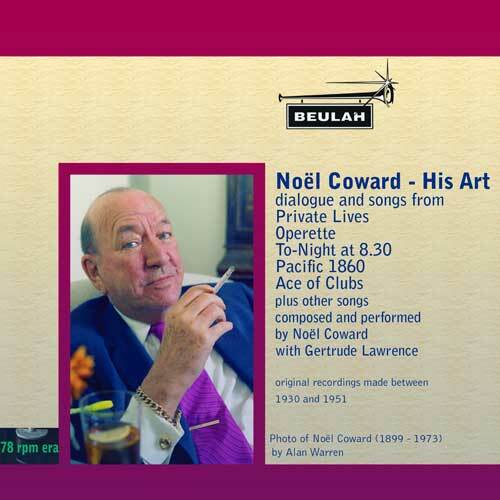 These recordings are ADD/stereo and none of them are otherwise generally available.
" I don’t recall hearing these Boettcher recordings, though he directed some of Alfred Brendel’s early Mozart and Beethoven concertos for Vox. 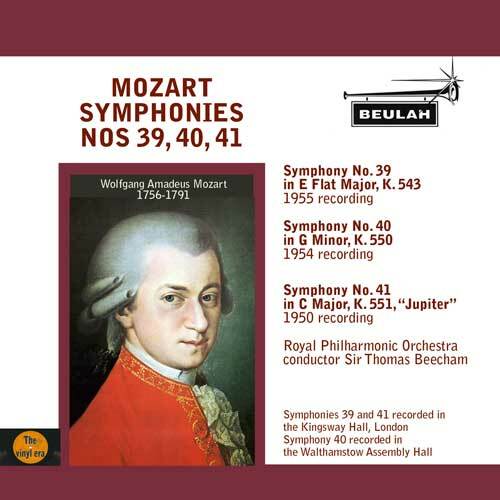 These are well focused and sensitive performances, though not quite the equal of the Vienna Octet Mozart recordings from the same period, several of which are also available from Beulah. Best of all for the dance music of Mozart and his contemporaries are the recordings which Willy Boskovsky made with his own Ensemble. The recording sounds very good for its age in this Beulah transfer. "The classic Sinfonia Concertante performances from this period came from David Oistrakh, with Rudolf Barshai (Artia, long defunct) and with son Igor (Decca, now on Legends E4702582, 2CDs). 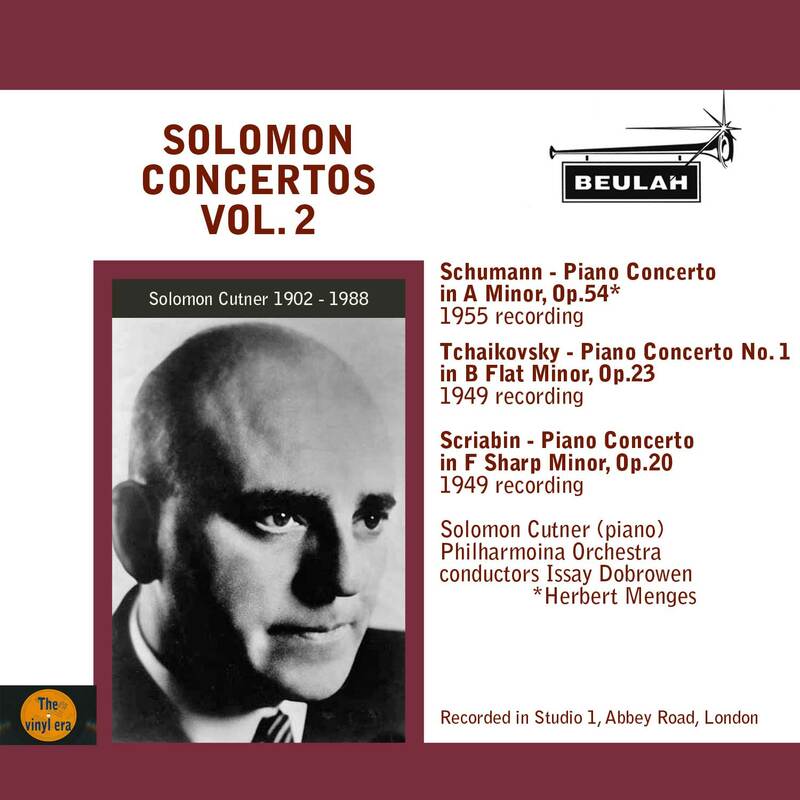 The recording is less full than from Boettcher and his team but well transferred considering the problems I recall from Supraphon LPs in the 1960s. The performance is another matter. 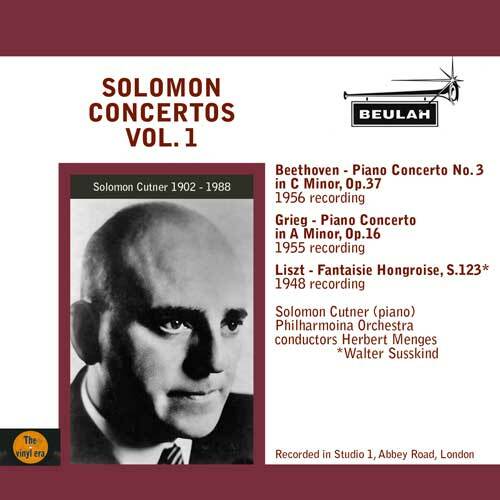 When first released in the UK in 1966 it was dismissed as routine and though I think that rather harsh, this is not Josef Suk at his best and there are other more recommendable performances "
"The Overture, of which this seems to be the only extant version, has come up sounding extremely well for its age. 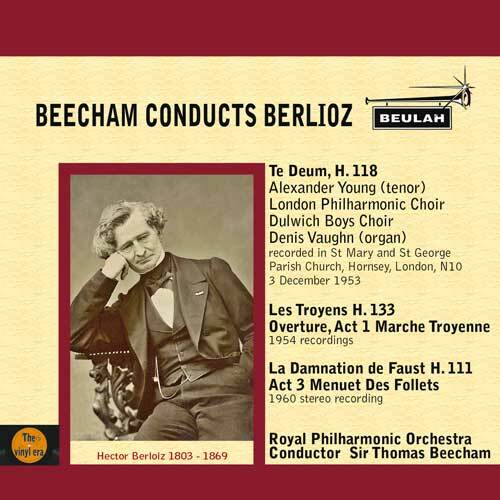 The Te Deum, on the other hand, sounds rather crumbly and though Eugen Jochum was a very fine Brucknerian I didn’t derive a great deal of pleasure from it, even with the volume turned down for comfort. 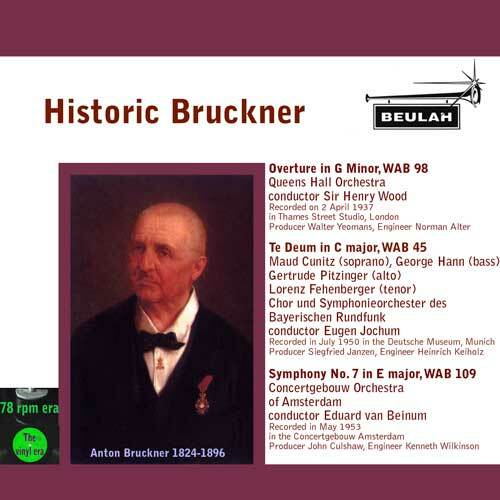 "Eduard van Beinum’s Bruckner is always worth hearing and this is the only generally available single-album offering of the Seventh Symphony: the Eloquence offering of Nos.5, 7-9, takes four CDs. The recording, described as ‘extremely faithful’ in 1953, has come up well enough in this transfer for the listener to appreciate why this ‘authoritative’ performance ‘full of grandeur’ has stood the test of time. Even with over 200 recordings of this symphony, the Beulah is well worth the modest cost of the download for the one work alone." 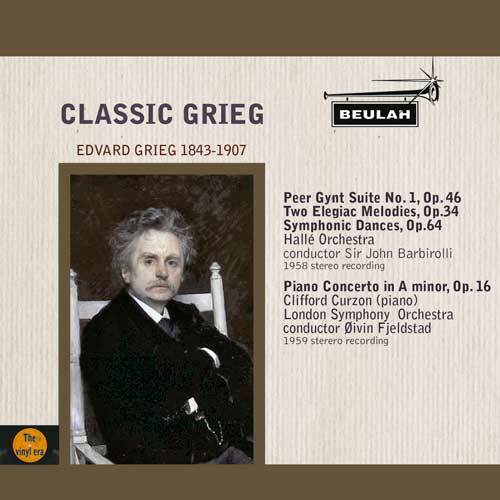 "I’m especiallypleased to see that one of their first new releases offers the classic recording of Grieg’s Piano Concerto in a minor, Op.16, made by Clifford Curzon with the LSO and Øivin Fjeldstad in stereo in 1959 – still my version of choice despite huge competition from the likes of Leif-Ove Andsnes’ two recordings. The original coupling was a selection from the two Peer Gynt Suites which I missed at the time, having opted for economy by buying the concerto alone on a 10” LP, but which I could wish had been reissued with the concerto. 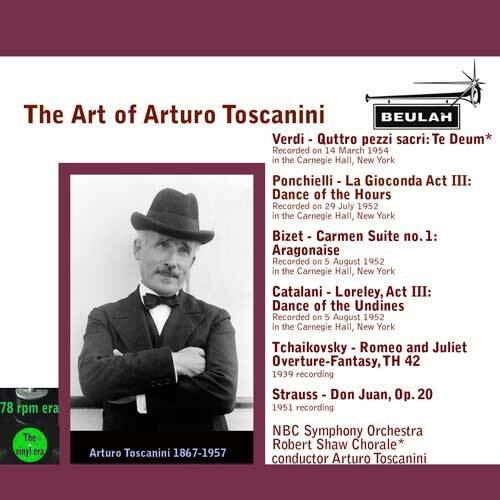 That said, Peer Gynt Suite No.1, Op.46, Two Elegiac Melodies, Op.34 and Symphonic Dances, Op.64, from the Hallé and Sir John Barbirolli (rec. 1958) make a very good substitute, extending the playing time to a very generous 81:09. "My only reservation is that the transfers are not quite up to the usual Beulah standards, with a degree of tonal insecurity, attributable, I believe to the quality of the original LPs rather than the transfer." " This transfer of Launy Grøndahl’s live broadcast recording of The Four Temperaments was my Reissue of the Month when it was released on its own and it’s even more recommendable as part of the new album. at this sounds as if it was ‘sung, played and … directed with love’. 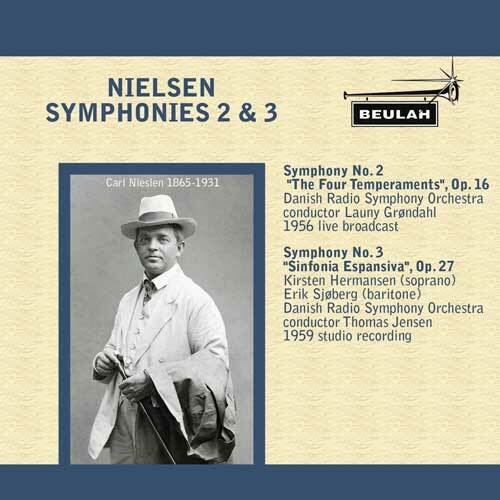 "Grøndahl’s 1951 recording of Symphony No.4 (Inextinguishable), again with the Danish RSO, is available inexpensively from Naxos Classical Archives (9.80540 – Bargain of the Month – DL News 2014/13). For the even more recommendable classic Jensen account of the Espansiva, it’s a question of whether you prefer it with No.2, as here, or with No.4 on a Danacord recording, which is also download only, for much the same price as the Beulah. "This new release may not boast the best sound – both recordings require some tolerance – but it offers an essential adjunct to modern versions of these symphonies." " These are classic accounts; if not quite the classic accounts of this music they are all well worth preserving. "Morton Gould’s first recording of Rhapsody in Blue, released in the UK in 1957, was slightly abridged but this remake is complete and intact. 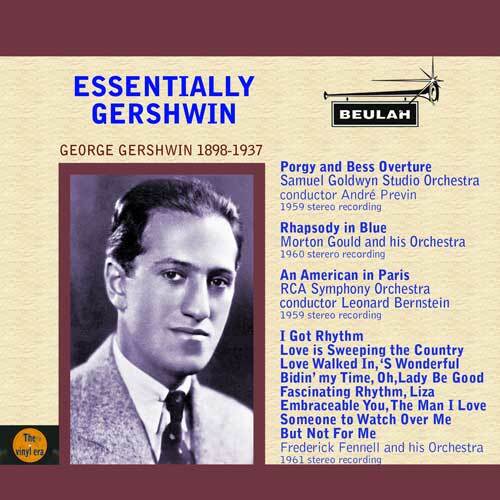 Having been nurtured on Leonard Bernstein’s CBS recording in various incarnations (now on Sony, with American and Piano Concerto) I enjoyed hearing this account of much the same vintage. "This RCA recording of American in Paris predates Bernstein’s better-known recording on Sony but shares most of the virtues of that later version: it seems to have been released in the USA on RCA Camden in 1958 rather than the stated 1959. "If anything, I enjoyed Frederick Fennell’s performances of the song transcriptions more than anything else on this album.